The Alps are a region which have this mountainous massif in common, but differ in so many other ways. What means: there is so much to see, to visit, to experience. Places we love to go from Slovenia to Switzerland, sights we love to visit, we will share it with you in this category. 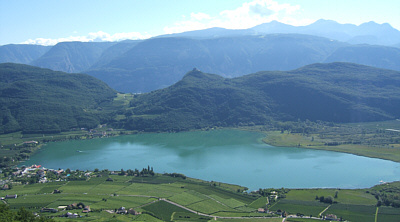 Kaltern (Caldaro sulla strada de vino) is on the wine route south of Bolzano. Kaltern is known for its red wine from Vernatsch grapes, the so-called Kalterersee, and for the actual Kalterersee (lake of Kaltern), the warmest lake in the Alps. These two aspects are well worth a longer trip. The beautiful area also offers walks and hikes for some possibilities. A beautiful trail in Kaltern is the "Friedensweg" (peace trail). He leads from the city Kaltern to the Church of St. Vigil or Vigilius in Altenburg and the ruins of St. Peter. Who is used to hiking can start directly from Kaltern, but there are also points along the road to Altenburg to get into the trail. The walk runs through the beginning to Kaltern through wine-growing region, into the cool forest. What is so interesting about the Friedensweg and special are the seven artworks on the way. The Friedensweg can be walked contemplatively and spiritually or even as an interesting walk for the family. It goes through the forest, past a playground, not to mention the fire water pond with a released family of turtles, on forest roads, ever again up and down through the Rastenbachklamm, a flume, along wooden piers to a small slope, through a narrow, fortified through high rocky stairs, often referred to the suspension bridge that is the direction of St. Vigil, or take a detour to the ruin St. Peter. Both at the ruins of St. Peter and shortly before St. Vigil you get a wonderful view of the Kalterersee and the beautiful area, with vines, beautiful vineyards, hills, mountains and good visibility in the view of the Dolomites to Laurins Rose Garden . The seven art objects along the way include the four cardinal virtues moderation, wisdom, justice and courage and the Triassic biblical faith, hope and love. 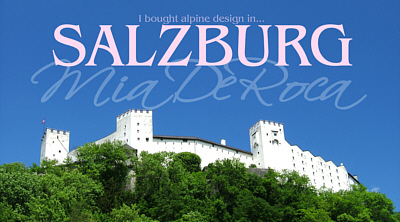 The art object on the way were designed by different artists from the Alps. The Tourism Information of Kaltern provide accompany material to to prepare for a spiritual trail. 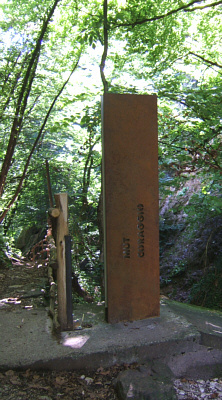 The sixth station "courage" is a beautiful table at the entrance to the Rastenbachklamm, on narrow wooden bridges is the gorge and along a steep iron level down. The last station of "love" is fromed by the ruins of St. Peter. Probably the oldest church ruins of South Tyrol, or Tyrolean entire area. It dates from the time of Christianity in the 4th Century and points to its walls still remaining frescoes from the 13th Century. In my travel guide, this way was described as a simple walkway, which it partly is. Seldom walkers, should refrain from walking the whole way, partly by the steep path through the forest (on roots and debris), especially the last part is narrow on different levels of rock steps, some walkability and basic condition is needed. Too young children should also not take the walk. 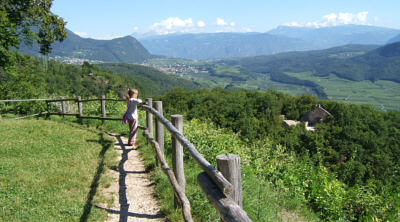 Children, aged 6, who like climbing and "used to mountains" might enjoy the walk. You should probably calculate with a walking time of 1.5 to 2 hours. With younger children, time for reflection or a small snack should be 3 hours for the hike estimate. The term "Friedensweg" in northern Italy has yet another meaning. It is a long mountain trail in the South Tyrolean and Italian Dolomites. It runs along the so-called Alpine southern front of the First World War length of 500km. If you are in Kaltern in the autumn, be sure to have a look at “Törggelen”.